Twice the Betting, Twice the Fun! 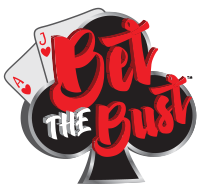 Bet The Bust™ plays similar to regular blackjack, except that players have the chance to bet twice on every hand of blackjack they play! Their first bet is on beating the dealer before the cards are dealt and their second bet is on the dealer busting once they've seen the dealer's up card - no matter what the dealer is showing. A secondary version of this game that is offered is called Bet The Bust™ 4-5-6, where players make their second bet when the dealer's up card is a 4-5-6 and pays even money.